Happy New Year! Happy Year 3 of New Earth! It’s going to be amazing. Kryon says that 2013 was a year of adjusting, shifting energies and “they” don’t count it. This is year three on New Earth. As I prepare to go over the latest several messages from Gaia Portal, my thought is that it may be time for those of us who no longer watch TV to sign up for cable. The dark ones will be removed from Earth very soon. Many have already been bargaining with Light forces for their lives, while still not letting go of their temporary powers. With them gone and their old systems of service to themselves crumbling, life on Earth will change quickly. Room is left for exciting positive changes in every aspect of society. Meanwhile we can look forward to expanded spiritual understanding and abilities. You may find very old memories beginning to occur to you. Do not be too sad if it becomes necessary to let relationships go. We are all going through major changes, in different ways and at differing rates. It is possible to love in a detached way, each wishing the other the best, so each can extend the realization of their dreams in the way their soul desires. Gaia Portal messages are telling us that it gets better and better. Enjoy the happy changes as they unfold in 2016! Here are my thoughts on the Gaia messages (in orange). Dramas unfold as dreamers are rewarded. Many dramas are happening behind the scenes now, as those on higher levels act to assure the New Earth changes. Those who dream of a happy, positive future for themselves and all on Earth are rewarded, as their dreams unfold. Flamboyants are moderated in priorities aligned with the New Light. Extremes of ideas, emotions and activities are made less so by the effects of the New Full Spectrum Light. Recall that Light is no longer filtered, as it comes from the Sun. This Light is Transformational to us. You may have found yourself setting aside some of your own predilections, your usual ways. We’re expanding our self-definitions. This is also happening for groups. In New Earth, we learn to act in harmony with each other and with higher spiritual forces. Hue-manity can rest no more. Those who have awakened and developed enough to be spiritual and act in service to others are Hue-manity. After being advised to take a time to relax and rest more, it is time for us to get back to work. We must serve as we came here to serve, to bring up the hu-mans, the regular people, each in our own ways. We are all facets of the All That Is, or God. It is time to serve by each shining our own facet. This will naturally be harmonious effort. Steps are taken to correct the imbalance. Benevolent higher forces, friendly extraterrestrials, and Light forces of Earth are working to moderate energies of Earth. Earthquakes, volcanoes and tectonic plate movements are already being lessened. Governments that don’t serve the people are falling, bringing peace. Soon, our material prosperity will be equalized, as well, with the banksters gone and new banking in place. Plans are made to assist in our physical and mental healings. Humans become Hue-mans and new ways blossom. All are at peace. (See previous mention of Hebrides.) We no longer act as islands of separate individuals concerned with self only. Prosperity in all things, material and non-material, is distributed. Learning that we are all One, we feel and express more unity. We have an abundance of Love to spread around. The energy workers (energetics) are as One and upgraded to the next level of density. Energies of Earth and Earthlings are harmonious in alignment and kicked up another notch in vibration. This lightens the density of all Earth dimensions, including the physical realm. There are various types of implants: from ET abductions, soul memory implants that affect incarnations (Dolores Cannon has spoken of them, but I don’t know in which book), and mental / thought implants that control us. Maybe other kinds. These have all been neutralized. Individual and collective desires are now for the good of all, and manifest very effectively. Energetic configurations such as grids and pyramidal shapes are comprised on and in Earth. These affect and reflect all that happens on the planet, not only physically, but in other ways. That includes new “pathways” for our abundance—all the many kinds of abundance and prosperity we desire. Regular people (non-spiritual or unawakened) have their minds cleared of restricting beliefs that have put a clamp on how they see the possibilities of reality. They are prepared to expand their minds to accept new ideas and discoveries. Some of the ones being assisted in this way may be the very ones to wake up and bring innovations or teach how we create our individual and collective realities. Even control of the body is by consciousness. Physical ill health will be eliminated, as we change our belief in it. And in due time, the physical body will be eliminated. I’m reminded of my grandsons when they used to say, “Hey, Grandma, know what we could do?” We are thinking outside the box! The new prosperity presents possibilities. This could be about project funding for groups of people in most need. It could also be other types of group efforts. There may be some meaning concerning new molecules, “combinings” of atoms. We are all recognizing that we do not die. We are immortal souls. As we sleep, we carry out spiritual activities. I suspect we are uniting in various ways, for various purposes, and maybe even in new spiritual families. Another take on meaning is that “those in the night” means those in darkness. Spiritual ceremonies create energetic (or spiritual) connections for them, to carry them forward to the Light. We are clean, shiny, and protected. Earth energetic configuration includes pathways from realm to realm. To go from a lower realm to a higher realm, or to rise between densities within a realm, is to “transcend”. Pathways are assisting people to so. New Earth transformation is nearly complete. Those assisting in Earth’s transformation see that all are attaining higher levels of consciousness. The individual strengths that those of Hue status have developed are acknowledged. It is recognized that regular people are advancing, each toward their own fulfillment. Unusual and beautiful displays of natural Light in the skies are increasing. The real meaning is that Hue-man individuals will rise as creative geniuses of art, science, government, etc., who play important roles in pushing humanity forward. Settlements in Gaia energetics have formed and establishments empowered. Gaia energies are stabilizing. Some areas are finally settled. Establishments may be taken as our own energetic configurations that have become more harmonious and Light. Human group efforts are also “settlements”, as are geographical areas and new societal systems like the new banking and financial systems. They are all strengthened by inner harmony and outer protective energies. Higher beings are assuring it. Technicalities are of no consequence to shadow energetics. No technical excuses are granted to those who played dark roles and do not want to change. They must change or not be here. Listing of consorts is pronounced. One list is of those who cooperated with the enslavement of humanity on Earth. New lists are made of those who will work together to create and run new systems for the betterment of humanity. Resources for those new systems are in place. 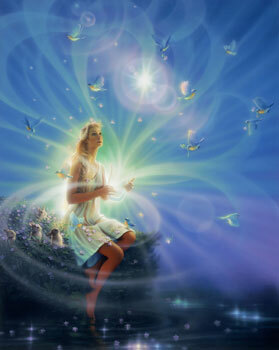 Flowers of angels are viewed within all of Gaia. Those angels appear within each of us. Lately, I’ve come to understand that when we experience angels, those angels, though real, are a part of us. Even the archangels. Stems of prosperity are presented. This could be the bundles of already partially distributed funds being presented to all of us. It could also be taken as channeling by individuals of ideas and guidance from their higher selves. The higher self is providing stems of prosperity. Taken altogether, stems of prosperity are presented to Earth. [Refer to Stems of Tides in an earlier article. We are accepting those stems—that guidance. We were bogged down with the Light forces not moving forward to elimination of remaining dark forces, for one reason or another. You can see this in the words of people in touch with those activities, such as Cobra and Benjamin Fulford. This stagnation is eliminated. Changes are being made. Another meaning is that we will no longer be stagnant in our self growth. We will receive and utilize the guidance. Promotions of Light come to fruition. Light moves us forward. Light, mostly from the Sun has brought this Transformation, in many ways promoting us to higher levels. Light is knowing, understanding. Regular people are waking up. Areas of energetic resistance in our Light bodies and Gaia’s have been cleared. We do not resist the changes in consciousness that accompany New Earth. We have completed the phase of absorbing energies from the Sun and some groups of other stars. Now, we are receiving the energies of the cosmos.